AXIS AIR GROUP, INC. is the only company that makes a system which supplies air to paint and a separate second air pump for cool fresh air to breathe. 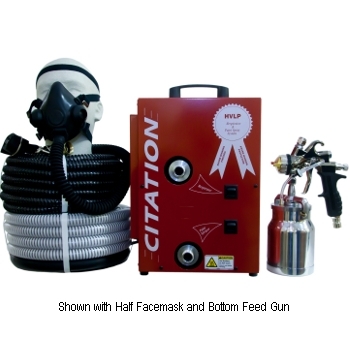 The patented CITATION FRESH AIR RESPIRATOR and HVLP PAINT SPRAYER. The Citation 4 HVLP Sprayer provides four stage turbine power. The extra power of 7 psi will reduce the particle size of the material being sprayed. Better atomization will equate to a finer finish. Recommended for today's more professional quality finishes. Available with a one-person or two-person respirator. 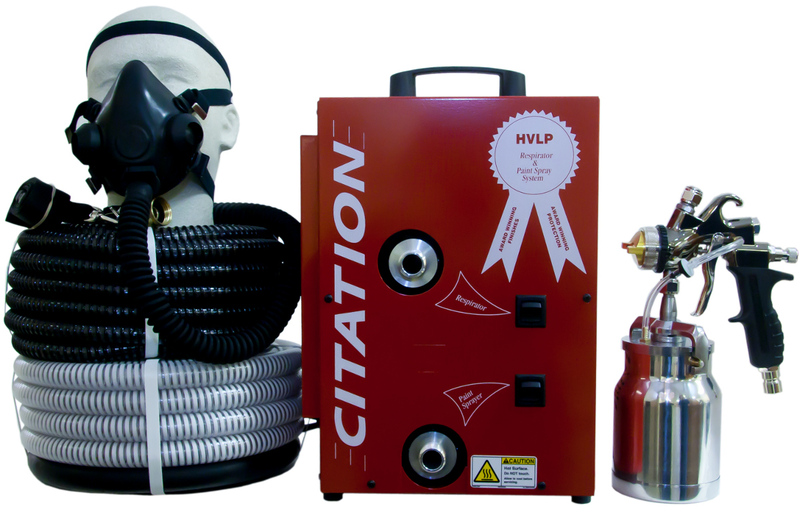 The Citation 4 combined HVLP paint sprayer and respirator system includes a paint sprayer and second separate air pump for cool fresh breathing air. Includes four stage turbine power and spray gun of your choice. Great for most finishes. You'll be suprised how easy it is to learn. Since its introduction on the market more than tenty years ago, the CITATION HVLP SPRAYER/RESPIRATOR has met and exceeded its expectations! No other spray system can offer the benefits that this system can. Cool Fresh Air to breathe, plenty of atomization for most paint spraying jobs and a professional quality gun. The extra power of the four stage will greatly reduce the particle size ofthe material being sprayed. Better atomization will equate to a finer finish. 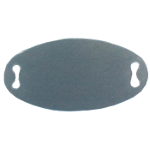 Recommended for today's mroe professional quality finishes. 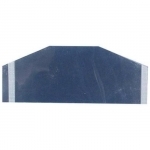 Recommended for automotive finish quality work with polyurethanes and clear coat material and latex. The four stage CITATION system offers the additional power required to achieve the finest finish.